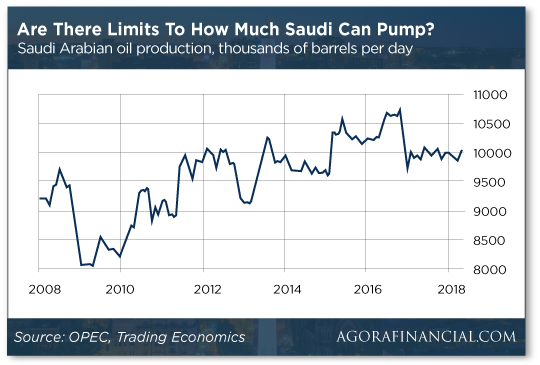 Saudi Oil Production: As Good as It Gets? Is this the real reason Trump’s courting Kim? A reader’s hypothesis on Chinese gold liquidation. The second half of the year is beginning the way the first half ended — with trade-war jitters. Over the weekend the president said his biggest weapon in the trade wars is the threat of tariffs on imported autos. “Cars are the big one,” he told Fox News. With that, the Dow is down 100 points or so. At 24,178 the Big Board is on the low end of its trading range going back the last two months. Not that it matters to charter subscribers of Tim Sykes’ Weekend Profits. On Friday, he recommended shares of a penny stock called SuperCom — which sounds like something out of a bad Saturday Night Live sketch but in fact is a cybersecurity outfit. For Tim, the company’s line of business doesn’t matter — only the near-term profit potential based on his proprietary indicators. And for these weekend trades, the profit potential must play out within 72 hours — in on Friday, out on Monday. In the case of SuperCom, Tim urged readers to sell as soon as the market opened this morning — good for gains of 10%. Now imagine if you could pull down a 10% gain like that three or four weekends every month. We’re just being conservative here — much of the time, Tim aims higher. Better yet, you can execute these trades without special permission from your broker to trade options. These are straight-up stock trades. Our charter-subscriber offer for Tim Sykes’ Weekend Profits is now closed. But as it happens, Tim has a complementary trading strategy for the workweek, too. Click here and Tim will walk you through it. Trade wars figure into the day’s big economic number. It being the first business day of the month, the Institute for Supply Management is out with its ISM manufacturing index. Numbers above 50 indicate a growing factory sector and the June number is 60.2 — way higher than expected. But the “internals” of the report are cause for concern. The supply chain is under stress and factories are taking longer to deliver goods. The “supplier delivery” number is up to 68.2, and this is an instance where higher numbers aren’t necessarily better. Instead, we’re looking at the worst disruptions to the supply chain since the “oil shock” of the mid-1970s. The cause? Steel and aluminum tariffs, say the report’s authors. “Respondents are overwhelmingly concerned about how tariff-related activity is [affecting] and will continue to affect their business,” says ISM’s Timothy Fiore. Gold is sliding as the second half of the year is underway. The bid is down to $1,245 — only five bucks away from the danger zone we told you about last week. If the president is trying to talk down the price of crude, it’s not working. Not much, anyway. At $73.78, a barrel of West Texas Intermediate has backed off 37 cents from Friday’s four-year highs. Not quite the same thing, huh? “This incident with the Saudis and the U.S. administration is just noise,” says Beat Wittmann of the consultancy Porta Advisors. “You cannot order 2 million barrels like ordering a coffee somewhere,” he tells CNBC’s European channel. Wittman, by the way, sees oil climbing at least another $20 or so from here. But never mind the politics. Let’s just look at the numbers. Saudi Arabian oil production is presently just over 10 million barrels a day. It’s never been higher than about 10.7 million. More than a decade ago Agora Financial was one of the few firms that dared to spotlight the book Twilight in the Desert by Matt Simmons — who spent a long career as an investment banker for the energy industry. In Twilight, Simmons cast doubt on the kingdom’s claims about the size of its oil reserves. Simmons was a “Peak Oil” guy and many of his forecasts have not panned out since his death in 2010. 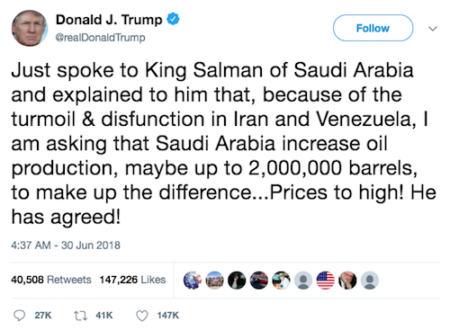 But one thing he said over and over has held up: Saudi Arabia is incapable of producing more than 10 million barrels a day for an extended stretch of time. Even when the kingdom was pumping flat-out between 2014–16 in hopes of bankrupting U.S. shale producers… the max was 10.7 million. We call BS on the kingdom’s claim of 2 million barrels a day in spare capacity. Does the president have any advisers doing likewise? 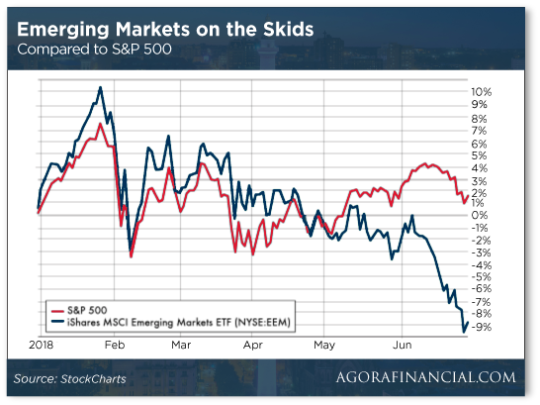 “We’re seeing continued weakness in emerging markets,” warns our Greg Guenthner — this thanks to the surging price of oil and the strong dollar. The iShares MSCI Emerging Markets ETF (EEM) wound up the month of June down more than 7%. “That would be its worst monthly drop since August 2015,” Greg says — a time when uncertainty about China’s economy spurred a global meltdown and caused investors to second-guess the value of emerging markets. 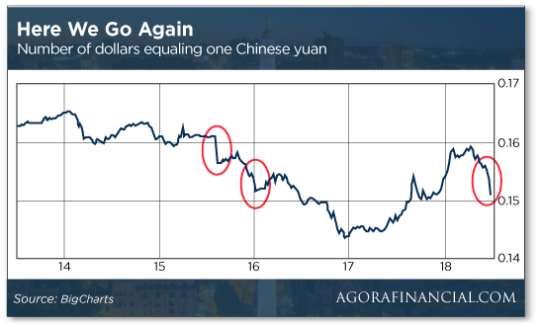 Oh, by the way — the yuan has just registered a drop against the dollar nearly as steep as that one in the summer of 2015. Beijing did a shock devaluation that August… and a more stealthy devaluation the following winter. Those two devaluations in 2015–16 both dragged down the U.S. stock market by more than 10%. This time the effect has been more muted… but it’s still safe to say a tumbling yuan is a drag on U.S. stocks. “The Trump administration’s embrace of Kim Jong Un has everything to do with one of the largest deposits of rare earth elements (REEs) in the world,” write Pepe Escobar, one of our favorite globe-trotting reporters. “All the implements of 21st-century technology-driven everyday life rely on the chemical and physical properties of 17 precious elements on the periodic chart also known as REEs,” Escobar writes for Asia Times. If you’re a really longtime reader, you’ll recall that China controls 90% or more of global REE production. During a dispute with Japan in 2010, Beijing laid on steep export limits — setting off a brief REE bubble that enabled some of our readers to profit 178% in five months. It turns out North Korea’s believed to have a deposit of 20 million tons of these metals — located about 90 miles northwest of Pyongyang and worth billions of dollars. With the stakes so high, “if the U.S. doesn’t make a serious play on the Democratic People’s Republic of Korea’s (DPRK’s) allegedly vast rare earth resources,” Escobar writes, “the winner… may be Beijing. So is Beijing attempting to outbid the U.S.? That’s a distinct possibility given President Xi Jinping’s met with Kim three times in as many weeks. Wanna get away? 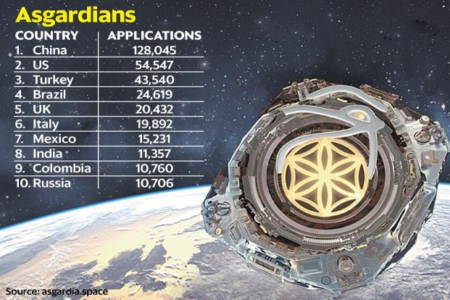 “Here’s a solution: Become a citizen of the nation of Asgardia and hope it makes good on its promise to colonize the moon,” Reuters says. Igor Ashurbeyli — Russian engineer, computer scientist and businessman — was inaugurated last week as the leader of Asgardia, named after Asgard of Norse mythology (as seen in Thor Marvel Comics movies). “Can I recommend,” a reader asks, “that Jim Rickards and his team examine the possibility that the price of gold may be slowly dropping in part because the Chinese are selling some of their gold reserves in order to shore up their forex outflow? “I have no special evidence for that hypothesis, but Jim’s analysts could examine other telltale signs. “I am not saying that the Chinese want to purposely lower the gold price, which is why the price deterioration is only slow. China may simply want to have extra cash in reserve to protect their financial stability, particularly if the trade dispute with the U.S. escalates. The 5: Jim is just back on the grid after climbing Denali in Alaska during the latter half of June, so he’s still catching up on correspondence. But we doubt anything has changed with one of the major themes he’s pounded away at since joining us at Agora Financial four years ago: Beijing is keen to accumulate as much gold as possible for whenever the international monetary system comes under so much strain that the global powers that be decide to hash out a new system — as happened in 1922, 1944 and 1971. A big gold stash guarantees Chinese leaders will have that proverbial “seat at the table” alongside the United States and Europe. P.S. One thing Jim Rickards passed along as soon as he caught up on news and correspondence is his assessment that the dollar’s big run-up in recent months is due for a rest. The dollar index is back above 95 after a two-month tear. But Jim says this is about as good as it gets and the dollar is about to start climbing back down. That’ll be good for gold… but it’ll be even better for the trades he lays on in Currency Wars Alert. This is not a currency trading service. Jim says forex trading is for pros only. But if you play the currency markets the way Jim suggests — “skimming” what the big boys do — you can generate immense gains without spending your days glued to a computer screen. We have a special offer on Currency Wars Alert today only. Check it out at this link.